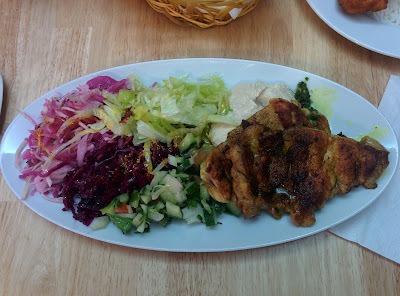 The small kosher restaurant at Belziger Straße 75 opposite Rathaus Schöneberg is a hidden gem in Berlin. The name explains what you get: "Orientalische Hausmannskost" means oriental home style cooking. It does not advertise the fact that it is kosher. We went there on a Sunday afternoon to find the place very pleasant. Quiet atmosphere and light decoration. Not empty but with enough space for a large family. Everything looks nice and tidy, even though the entire restaurant is just one small room with 4 tables and an open kitchen. 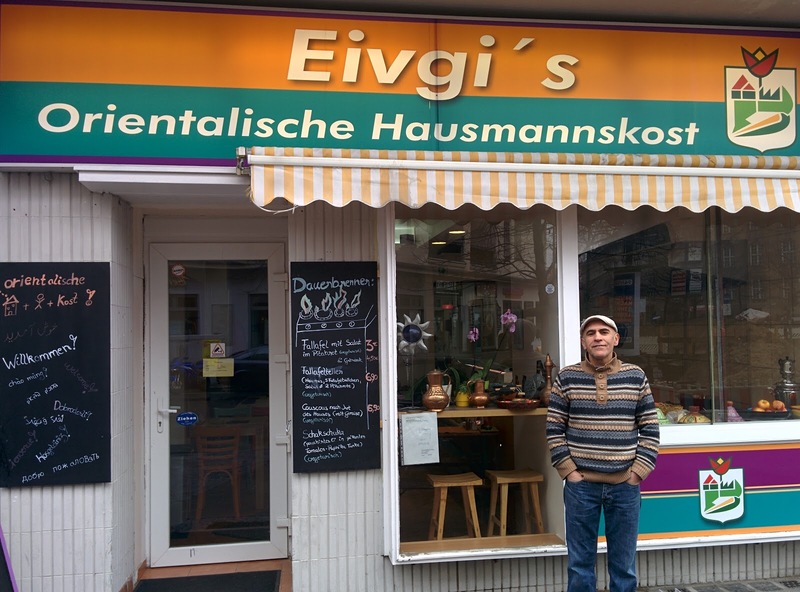 The restaurant is kosher meaty under the supervision of Rabbi Yaacobov of the Berlin Jewish Community. The menu is not too long and consists of different falafel and salad combinations. If you ask then you also get a nice choice of meat dishes with chicken or beef. 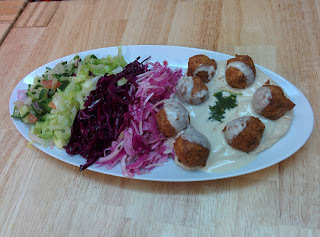 There are also fish balls, shakshouka and other oriental foods. Our family ordered almost everything that is available: Schnitzel with rice or salad, chicken marinated steak (pargiot), meat balls, falafel with hummus and pita. 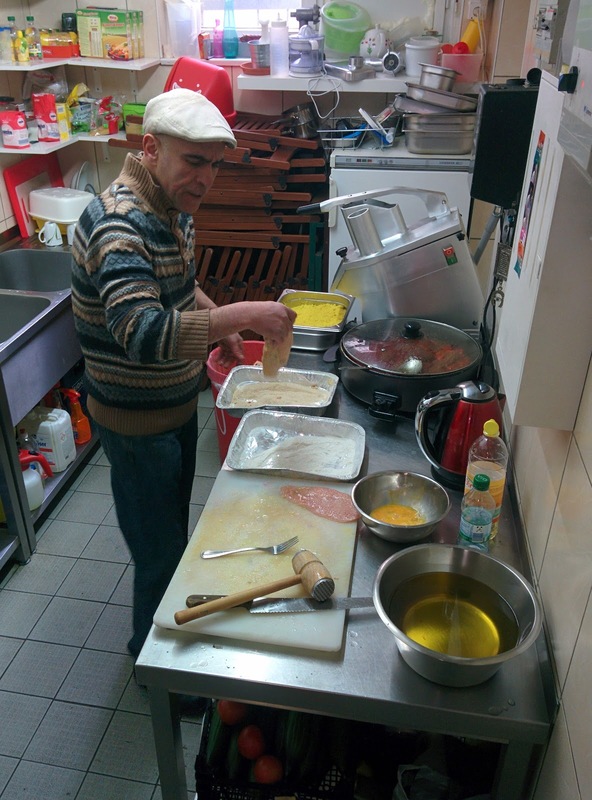 That is when the special treat starts: You can actually watch how Shalom Eivgi, proprietor and chef, starts to cook everything fresh. All dishes are really home made. The hummus follows the famous Abu Gosh recipe. We did not have to wait long and everything was served together. The food itself was extremely delicious and left everybody pleasantly filled and satisfied. Just like at home, one could say. We paid 64€ for 5 people with 5 dishes and drinks and felt that we got a lot of value in return. The restaurant also offers deliveries and catering and is open Sun-Thu 12-21 and Fri 12-16/19 (winter/summer). 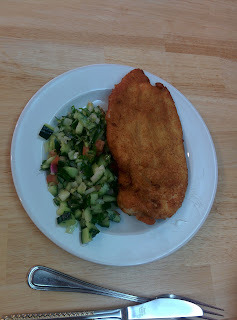 Our next visit will be with the Kosher Berlin meetup group, please sign up there if you want to join us. Great! I'll visit there and try its taste.